The Food Bank is a distribution center that provides an efficient operation to collect, sort and distribute food. We secure food donations from corporate food donors, state and federal food assistance programs and Feeding America, the national food bank network. Food is also obtained through a purchase program where large quantities of food are purchased at reduced price to offer to its network of hunger-relief programs. 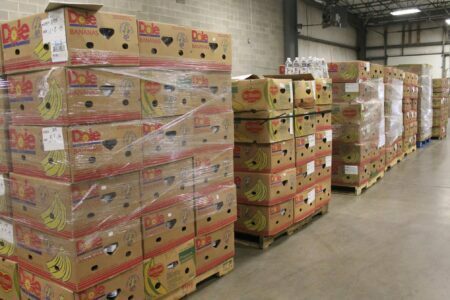 Much of the donated and purchased food is transported to the warehouse and out to our member partners across 11-counties by the Food Bank’s fleet of trucks. The Volunteer Center is where donated food is inspected, sorted and repackaged in preparation for distribution. Volunteers provide thousands of hours of support every year, helping to prepare this food for those in need. Every day, our hunger-relief partners place food orders, receive deliveries from us or pick up orders at our Duquesne headquarters. Our partners then provide this food through their food pantries, hot meal sites, or shelters to the neighbors in need. Together we feed more than 360,000 people every year.